Today's note is about a new and exciting addition to what we do here at MCF. You locals are probably already aware as this as been a bit of an ongoing process, but I'm happy to announce today that we're also now offering fine, rare and boutique spirits on our shelves! This isn't something I've taken on because I think I'll be able to take a bite out of the high-volume, marketing-driven liquor sector. I'm doing it because I share the same type of passion for classic, character-driven spirits that I do for classic, character-driven wines. What we hope to offer are the most interesting and unique items that we encounter -- things that truly inspire us. From the classic single malts, to fine aged Rums, to new American boutique distillers, to terroir-driven Cognacs and Armagnacs, to the coolest and most unique one-off 'bottler' releases, everything here will be selected based solely off its quality. With that in mind, I thought a fun way to kick things off would be with something that probably lies a bit off the beaten path for most people. If Cognac, as a category, has a small, but very devoted following, Armagnac occupies an even tinier slice of that following. There are some technical differences in production and there are differences from the terroir, etc., but the aromas and flavors are, as always, the most relevant thing to discuss. Where Cognac is deeper, and more polished/luxurious, Armagnac is generally quirkier and more terroir-driven. A good comparison might be a rich, polished Cabernet Franc from Saint-Emilion (Cognac) versus an an earthy, herbaceous Cab Franc from the Loire (Armagnac). Of course that's a broad statement, but I think it paints a good picture of what to expect. Domaine Séailles is a small, family run estate in the Ténaréze district of Armagnac. They were one of the pioneers of agriculture biologique in the region and they have not used any chemical fertilizers, herbicides, insecticides or other synthetic chemical products since 1998. They grow a range of grapes for the red and while wines they produce, but when it comes to the Armagnac, they utilize Ugni Blanc solely. They do produce blended versions with a 20yr designation, but most of their brandies are vintage bottlings. Everything they bottle spends at least 20 years in the barrel and are bottled to order. The most exciting part is that they have a long library of vintage brandies at the estate, so I'm excited to hopefully be offering more than one at a time in the future! 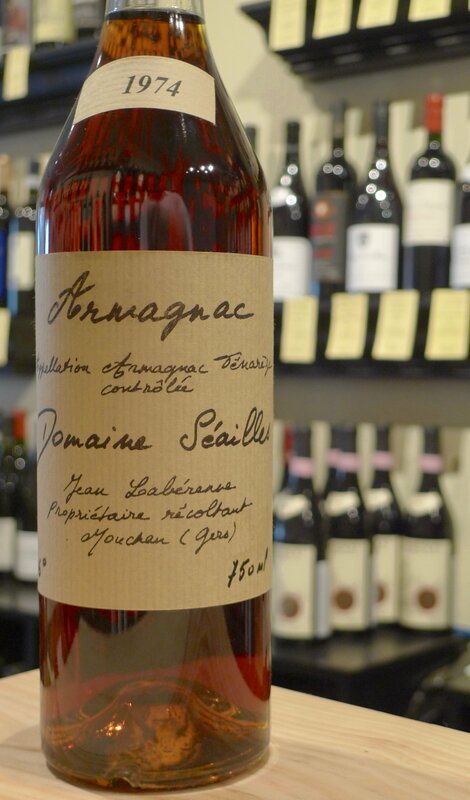 Today's offering, 1974 Armagnac of Seailles, is one of my favorite drinks in the shop right now -- so much so that I had to declare my home bottle 'off limits' for a while because I noticed it was depleting way too quickly! This is a beautiful expression of their style, complete with tantalizing woodsy, smokey aromas and a deep, dark fruit. On the palate, the fine, polished flavor of the barrel sits stoically in the background, allowing the robust floral and brambly notes to fully express themselves. That slight flavor of the wood emerges only at the back as it brings the long, singular finish to a close. As the weather begins to cool, this is exactly the kind of thing I love to have on hand for the end of the day, as you tuck into a spot on the couch for a final, warming dram. All spirits purchases are subject to NYS sales tax.